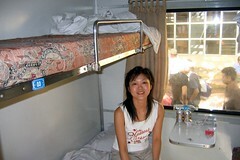 Typical Vietnam Railways cabin consists of 4 soft sleeper berth, 2 upper and 2 lower. A bottle of mineral water and a cake or bun are provided. There are about 10 of such cabin in a train carriage. Besides soft sleeper, there are also hard sleeper, where there are 6 hard sleeper berth in a cabin – upper, middle and lower berth on each side. Basically it’s a soft sleeper without mattress, you’ll sleep on a wooden bed. I also had a glance on a carriage which I believed was hard seat. I initially planned to travel on hard seat class, as it’s so cheap. But I felt lucky I was not, as it’s a wooden chair with separator in the middle which is unable to recline, and 2 person sit on both side of it.